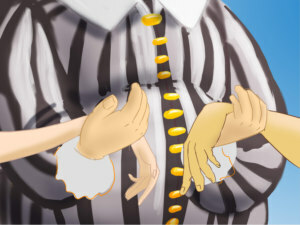 “A cat!? That’s all my father left me? A cat?” thought the youngest of the three brothers. “He gave my eldest brother a mill and my other brother a donkey. But I deserve a cat, I guess.” He was miserable. What an odd decision his father had made before he died. “My brothers can work together with the mill and the donkey. They can earn honest money and make a good living out of it. But what about me? I can’t even eat the cat…” he wept. The cat jumped upon his shoulder, coughed as if he wanted to say something, and then he actually spoke with a human voice. “Master, excuse me for interrupting your thoughts, but you seem worried and since I belong to you now, I would like to make an oath to make you happy and rich,” the cat said. “I can somehow understand what you’re saying,” said the miller’s son, after coming to terms with the fact that the cat his father had left him could talk. “But how on earth could you possibly help me?” he asked. “Please, my lord, try not to think too hard, but quickly find me a pair of boots and a bag of some sort. These are the only two things I will ever ask from you. 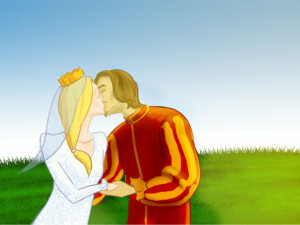 In return I will arrange it so that you will marry the young princess of the kingdom.” The boy didn’t quite believe this promise. 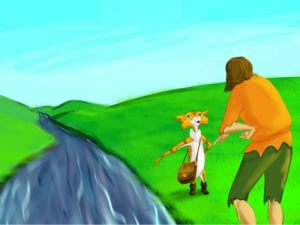 But he had no other choice, and soon he handed the cat a small pair of boots and a bag. The cat jumped into the boots, pulled them up and in one elegant move threw the bag over his shoulder. He went into the woods. 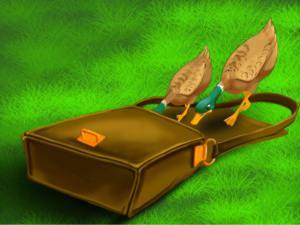 There he laid the bag on the ground and covered it with leaves. 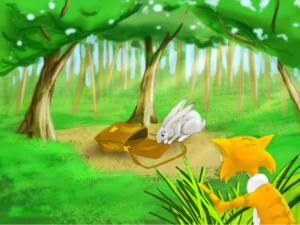 Soon a young rabbit stepped right onto the bag. The cat didn’t wait. He drew the laces and went straight to the palace. 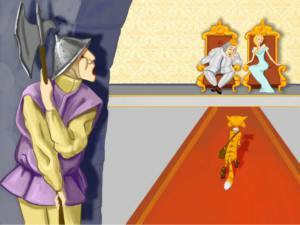 The king’s guards didn’t even bother to stop him – they were so shocked when they saw a cat in boots! The visitor entered the throne room. 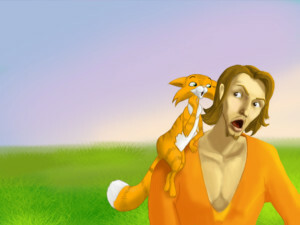 “This is a gift from my noble and handsome master – Marquis Carabas!” the cat said, and took out the frightened rabbit. “Thank the Marquis and tell him I really like it!” the King answered. 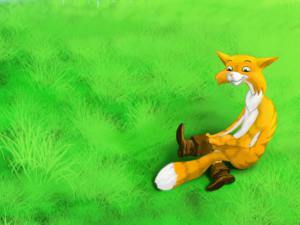 The young princess, who was sitting next to her father, suddenly cheered up. A week passed and the cat took his bag again. That time he left the bag open in the middle of a corn field and left handful of grains to lure birds. In an instant two ducks ran into it and again he drew the laces. The King was again very pleased with the gift. This continued for a few months and every time the cat would bring a different animal to His Majesty. 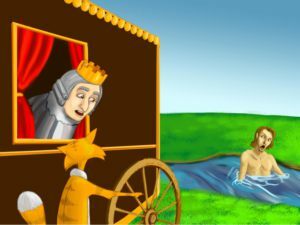 The king immediately ordered a new set of clothes to be given to the Marquis and welcomed him to join their royal river drive. 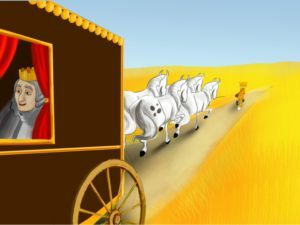 Stepping into the coach, Marquis Carabas set his eyes on the princess. She blushed at once, because he was very handsome indeed, just as the cat had once described him. The cat himself was busy. 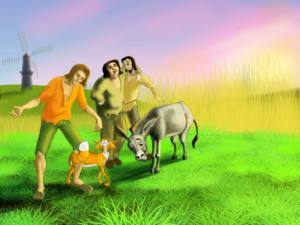 He was running ahead as fast as he could until he reached some countrymen who were working in a meadow. “Hello, good people! 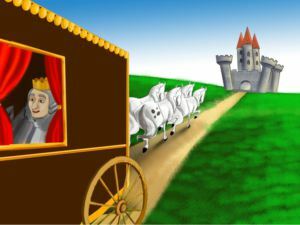 The King is coming your way and if he asks you whose meadow this is, you should tell him it belongs to Marquis Carabas. If you don’t say that, you will be turned into minced meat”. 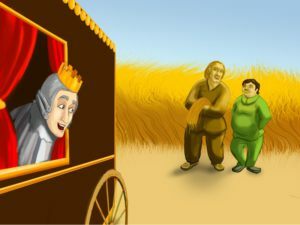 The king asked the workers whose meadow it was. They hurried to answer that it belonged to Marquis Carabas. Still running ahead the cat came upon some reapers and said again: “Hello, good people! 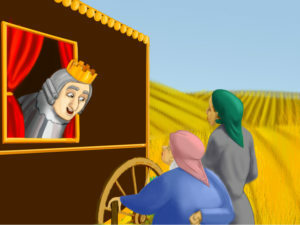 The King is coming your way and if he asks you whose cornfield it is, you should tell him it belongs to Marquis Carabas. Or you will be turned into minced meat”. The king stopped again. 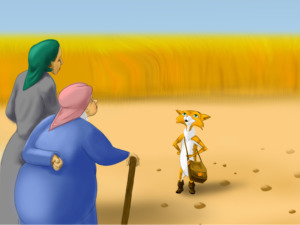 “Who does the land you’re working on belong to?” the king asked hoping to receive the same answer as before. The people confirmed it belonged to Marquis Carabas. 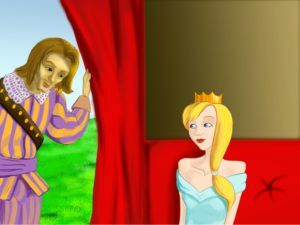 The King looked pleased and the princess was fascinated. 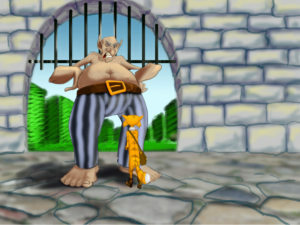 At last the cat arrived at a castle, ruled by an ogre. “Who are you and what are you doing in my castle”, the ogre asked in a fearsome voice. “I came to tell you that the King is coming this way and if he asks whose the castle is, you should tell him that …”, But the cat couldn’t finish his words, because the ogre was growling. 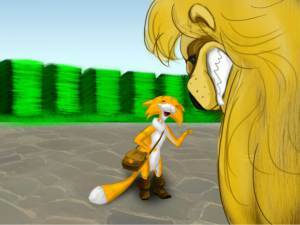 “Who do you think you are ordering me what to say?” he said and all of a sudden he turned into a lion. The cat pulled himself together and laughed at the lion. “Ha! That was fun, but I have already heard of this trick of yours. It’s easy to turn into something your size but try to fit into a small animal’s body, like a squirrel, or… a mouse. It’s impossible!” said the cat distrustfully. “Impossible?! Impossible?! Watch this!” the ogre answered. 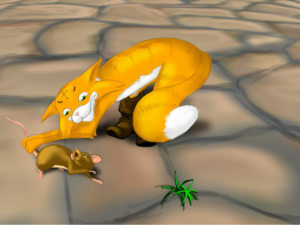 The next moment a little mouse was squeaking at the cat’s feet. The cat had been waiting for that and at once pounced on the mouse and killed it. Meanwhile the king arrived at the castle. His curiosity made him want to visit it. At the gates he was met by the cat. 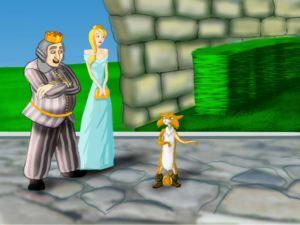 “Welcome to the castle of Marquis Carabas!” The King entered the castle followed by his daughter and the Marquis. The King was charmed by what he saw and told the Marquis that he would be glad if his daughter married such a fine young man. 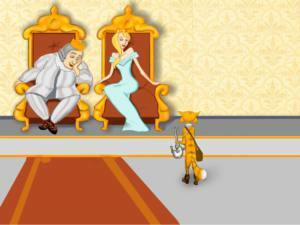 The Marquis thanked the King for the honour and kneeled before the princess. They married and lived happily ever after. And the cat became a noble lord, who even started wearing gloves and who chased mice only for fun.